In 1964, there were no phones in the Équateur Province. Contact between mission stations and the outside world was dependent upon gasoline-powered, World War II surplus radio transmitters. The network was their vital connection, always humming with activity. Voices would crackle over the radio asking if anyone had any intravenous fluid. Or an extra tank of oxygen (which might turn up one used for welding!). Along with sharing resources, the network of medical missionaries consulted with one another on cases and procedures. They passed along news of the world and local updates. 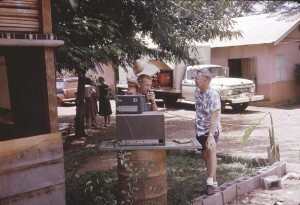 In a time and place where visiting distances might be hundreds of miles over several days, keeping in touch over the radio network was critical. 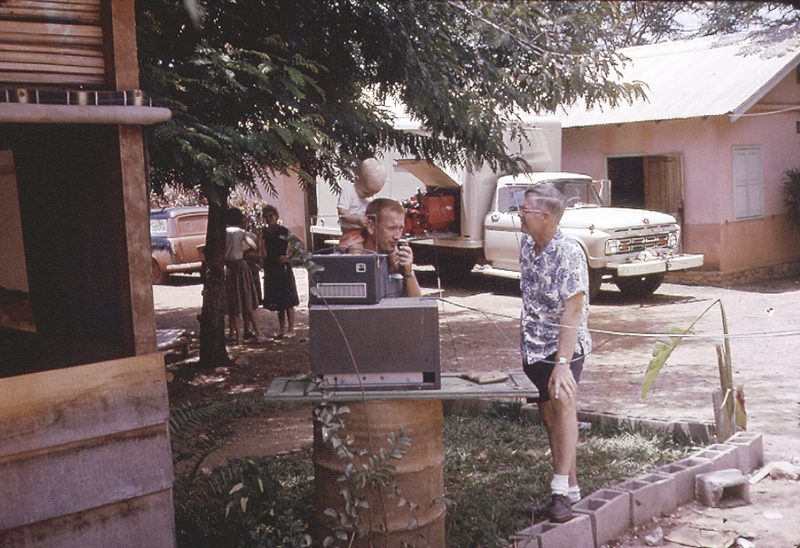 In the spring of 1964, the radio crackled that a missionary doctor at a faraway station was stricken with malaria. Dr. Paul Carlson made an all-night drive through torrential rain over muddy jungle roads to treat this colleague and consult with others across the network. Today, the global network is digital and wireless, relying on solar power since electricity and cell phone coverage are still rare in the Equateur Province. Consultations are made via Skype using satellite connections, sometimes with colleagues on the other side of the world. US-based PCP Medical Ambassadors use every available technology to communicate with their colleagues in Congo, working in partnership to understand and support one another. In this photo, Covenant missionaries evacuated to the Central African Republic await news of Dr. Paul. Bob Thornbloom listens over the radio, trying to contact his friend.